Despite efforts by the UK, there are likely to be more "lone wolf" terrorist attacks throughout Europe because of a lack of coordination of intelligence within and between EU states, Sputnik has been told. The news comes as it emerged as British journalist had obtained personal training — via social media — on how to carry out a terrorist attack, through contacts with Daesh, also known as ISIL. An investigator from The Sun newspaper spent two months being coached on the orders of Daesh's top recruiter — Abu Muslim Khurasani — using the encrypted Telegram messaging app to communicate. The journalist was sent a bomb-making guide and ordered to get the readily-available materials to make an explosive device and hide it in a car. A hit-list of targets included the Hoses of Parliament clock tower — known as Big Ben — before deciding on a major shopping center for a Nice-style atrocity, which the newspaper has refused to name. Dr David Lowe, Academic Fellow of the Inner Temple and Principal Lecturer at the School of Law at Liverpool John Moores University, told Sputnik: "Groups like [Daesh] have been doing this for the last few years and they've had a very effective media system. They have a media ministry — a lot of the videos we seen comes from the Al-Furqan institute in Damascus — they've decentralized their social media and that's been the most effective part. "They can speak in a number of languages and have their own members and followers using their own accounts, so it's no surprise that they're using this. There is a potential that you are likely to see an increase of attacks in areas like France and the same with Belgium." 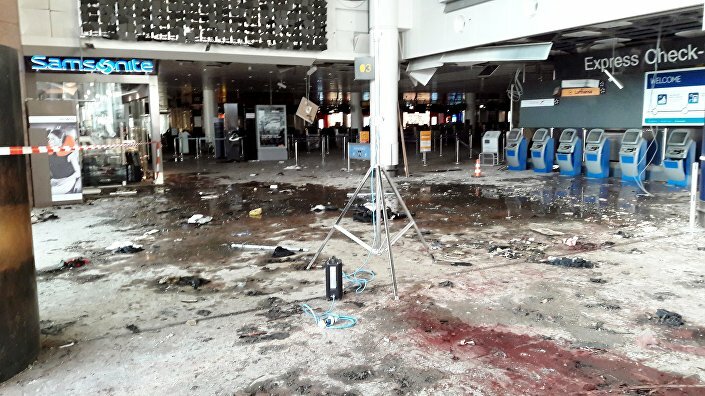 Damage is seen inside the departure terminal following the March 22, 2016 bombing at Zaventem Airport, in these undated photos made available to Reuters by the Belgian newspaper Het Nieuwsblad, in Brussels, Belgium, March 29, 2016. He says the British intelligence services — MI5, MI6, GCHQ and the Joint Terrorism Analysis Centre (JTAC), as well as the police counterterrorism command — have been extremely adept at monitoring the "chatter" on social media to prevent terrorist attacks in the UK, but this is not the case in mainland Europe. "So far — and I'm touching wood saying this — in the UK we have been pretty efficient, because JTAC is coordinating all the intelligence coming in and constantly assessing the threat. Post 2005 [the London 7/7 bombings], one big lesson we learned is that our security agencies have got to talk to each other and to the police […] and they work quite closely together," Dr Lowe told Sputnik. Londoners pass the Elizabeth Tower (C) which houses the "Big Ben" bell in the Palace of Westminster in central London on June 28, 2016. Dr Lowe also said the UK has led the way in coordinating intelligence between the various law enforcement agencies — a source of criticism following the Paris November 13 attacks where significant failures were exposed — most notably "silo working." "The French system is so bureaucratic. You've got groups in their various security services who don't really talk to each other. It was an issue. At Europe and the European Counterterrorism Center, set up in January 2016 [to coordinate intelligence throughout Europe] was roughly set up on the UK model. "It should come as no surprise because Rob Wainwright [Europol's director] is British and he led that. But it is frustrating because you've got to get through this culture — social and political — of states like France which are very, very bureaucratic."